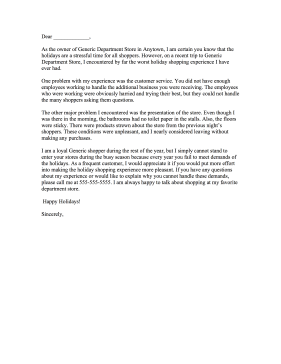 During the holiday rush of Thanksgiving and Christmas shopping, this complaint letter can be used in retail stores. As the owner of Generic Department Store in Anytown, I am certain you know that the holidays are a stressful time for all shoppers. However, on a recent trip to Generic Department Store, I encountered by far the worst holiday shopping experience I have ever had. One problem with my experience was the customer service. You did not have enough employees working to handle the additional business you were receiving. The employees who were working were obviously harried and trying their best, but they could not handle the many shoppers asking them questions. The other major problem I encountered was the presentation of the store. Even though I was there in the morning, the bathrooms had no toilet paper in the stalls. Also, the floors were sticky. There were products strewn about the store from the previous night's shoppers. These conditions were unpleasant, and I nearly considered leaving without making any purchases. I am a loyal Generic shopper during the rest of the year, but I simply cannot stand to enter your stores during the busy season because every year you fail to meet demands of the holidays. As a frequent customer, I would appreciate it if you would put more effort into making the holiday shopping experience more pleasant. If you have any questions about my experience or would like to explain why you cannot handle these demands, please call me at 555-555-5555. I am always happy to talk about shopping at my favorite department store.